Book Review: Go Dairy Free | Cook. Vegan. Lover. 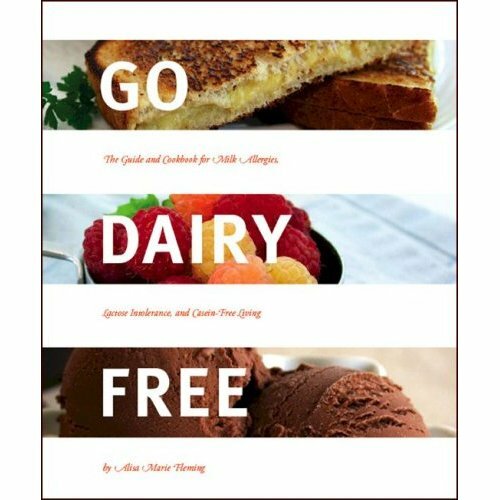 Go Dairy Free by Alisa Marie Fleming is a guide and cookbook for milk allergies, lactose intolerance and casein-free living. The book starts with a guide to Understanding Dairy and Dairy-Free From a Health Perspective these are the first 5 chapters the book. These first 5 chapters provide a massive amount of information about dairy, the benefits of living dairy-free and any concerns that one might have about going dairy-free. The next two sections are Grocery Shopping & Preparing Your Kitchen and All You Ever Wanted to Know About Dairy Substitutes I think both of these sections are really great for the newly vegan/those going dairy-free. In these sections you can find shopping ideas as well as what are some great alternatives. Here you can learn about a variety of milk alternative s from soymilk to hemp milk. This section is a great tool for those seeking more information on what the next steps are to living a dairy free life. Now that you have made it through all the sections on what dairy is, why you should go dairy-free, what your pantry needs and what there are for dairy substitutes it’s finally Time to Eat! This section is filled with a number of recipes by Alisa Marie Fleming as well as various authors and fellow bloggers such as Ricki at Diet, Dessert and Dogs, Susan from Fat Free Vegan and Celine from Have Cake Will Travel. All of the recipes featured in this book are great examples of yummy dairy-free recipes that anyone will love. The book ends with recommended resources such as online sources in the forms of blogs and various websites. There are also suggested “offline reading and resources” which vegan, gluten-free/casein-free, food allergy and children’s books. Lastly, there is a great index the list the dairy alternatives and recipes and details whether they are vegan, egg-free, soy-free, gluten-free, wheat-free, nut-free and/or peanut-free. Overall this book is a great resource for those who are looking to learn more about going dairy free. All of the features from dining out to stocking the pantry as well as great recipes for everyone to enjoy make this book a great resource. Disclaimer: Fleming Ink provided me with a free sample of this product to review, and I was under no obligation to review it if I so chose. Nor was I under any obligation to write a positive review in return for the free product. This entry was posted in Book Review and tagged Book Review, go dairy-free. Bookmark the permalink. I got a free copy of this to review too. And I love it. The recipes, especially the ones for making your own coconut butter and cheeses, are awesome! I love Alisa and I also have this book and with each passing night that I stay up wayyyyy past my bedtime reading it, I fall more in love with all her recipes!! Alisa is beyond a genius! Oh and my coconut oil came today! And I am dropping you some linky love in a post later today. Thanks for bringing this book to my attention – I look forward to checkng it out. I referred to this post and your blog in my first ever Favorites Friday postand wanted to let you know. Thanks for sharing all your vegan widom!